On Tip Junkie this week Laurie is asking for our favorite post of 2008. I really love this idea on getting together with friends on a wintry day and knitting…or some other simple craft. With a few snacks or simple lunch it would be a great way to spend time with great friends. Here are a few suggestions on pulling it all together. A few years ago on a snowy winter day a friend invited a few of us over to knit. Some were new knitters and some including myself just needed to refresh. It was a lovely afternoon just sitting in the living room talking, snacking and helping each other with our knitting projects. Within a year she moved back to Australia. One day while walking through Target I saw this book on the shelf. It instantly brought a smile to my face as I remembered our day of knitting. Dianna you need to come back…I haven’t touch my sweater since you left! This book has easy illustrated instructions and patterns and can be found at Amazon.com. 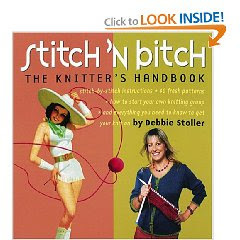 So why not pick up this book or any knitting guide and invite a few ladies over for a great afternoon. 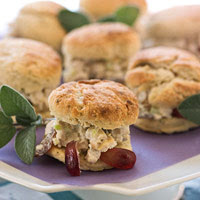 Serve a light lunch…this Spring Chicken Salad sounds delicious and easy to make. Here are a few ideas for the table…Toss a few skeins of yarn in a basket with a few knitting needles. Create a charming table with mix and match china and silverware. Add some pretty paper napkins and lace placemats. This is a great time to use old and interesting items you may have. These are a great collections of antique tea spoons my mother has collected. Not one matches…all are very beautiful. Same goes for the tea cups and saucers…they are a nice eclectic mix. Find many great flavored teas at Bag Ladies Teas …or give these as a little party favor.